Kraft, a pioneer in household appliances, keeping up its reputation for leading the market through innovation, unveils its latest master chef ‘Jumbo Grill Toaster’. Designed keeping in mind the needs of a modern lifestyle, the Jumbo Grill Toaster makes sure your sandwiches are browned to perfection. Elevating the outlook of your kitchen with its sleek, aesthetic design, this 2000W toaster prepares quick and healthy snack in the comfort of your home with the least effort. The toaster has Non-stick inner surface& equips a floating hinge system that adjusts easily to any type and size of toast giving you evenly cooked toast on both sides. 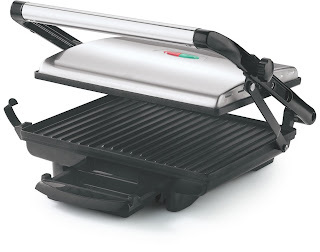 Make fresh and healthy delicacies every time with this Jumbo Grill toaster that has a non-stick coating, which prevents the bread from sticking on to the plates& also lets you use minimal amount of oil while making a sandwich. It also has an oil collector tray that collects excess oil promoting healthy & fat free cooking. To prevent your sandwich from getting overcooked or burnt, this device comes with a light indicator which informs you of the progress of your sandwich. It also comes with a lid lock feature that keeps it firmly closed while it is in use. Adding to the convenience is the anti-Skid Feet of the toaster that ensures the appliance stays balanced on any surface it is kept, moreover to ensure maximum user safety. The toaster is built with a sturdy, heat-resistant body along with the overheat protection & cool-touch housing heat-resistant body that keeps the outer surface cool even when in use preventing any accident that could occur, especially if you have kids around. Safe to handle, simple to operate and easy to clean, the toaster can also stand in an upright position for compact storage when not in use, occupying minimum space in your kitchen to facilitate better usage. Now make tasty & healthy sandwiches comfortably in no time with this Kraft Jumbo Grill, the product is already available in leading retail and ecommerce portals across India.